I can help you speak persuasively to your ideal industrial customer… Because I’ve been one. When promoting your new or existing industrial products and services, nothing provides more credibility than a B2B case study. Why? I've often said that while everybody wants to be Number One... few want to be "first." At least, not when it comes to purchasing a new, … Read on! 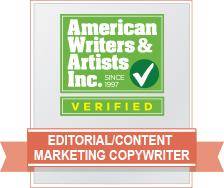 I’m a professional, freelance business writer, specializing in content marketing; content that engages readers and promotes my clients as credible, reliable and trustworthy. Steve is a terrific writer to work with - timely, thorough, enthusiastic, and a genuine pleasure to hire. His writing is conversational and informative - exactly what we need on the web today. I'm privileged to consider him part of my writing team! "Steve Maurer is a well-trained copywriter who provides excellent content and works 110% to give clients what they want, when they want it. If you are looking for a responsible professional who provides results, call Steve." When we first started blogging, we were struggling to get our blog posts completed efficiently. Steve helped us get our thoughts organized and on paper and also made recommendations as to how we could improve our lead magnet and website in general. Steve has a special gift for making dry subject matter interesting and easy to consume – and that’s not an easy thing to do. He’s friendly, down to earth and very easy to work with. After five minutes talking with him you’ll feel like you’ve been old friends for years. Don’t hesitate to call him. Great guy. Steve contributes to the Uberflip Blog on an ongoing basis and is exactly what you want in a freelance writer, and more. Not only is he an expert in his field and an engaging writer (his pieces are always hits with our audience), he’s a complete professional and so easy to work with. He routinely beats deadlines and approaches his work with a genuine enthusiasm – I always know I’m going to get great results. Steve wrote quality, in-depth technical content for our blogs and website for several years. He has an extensive technical background and has been able to learn about our products and company very quickly. With that he has been able to provide us with great content as if he were an actual in-house employee. Steve has strong writing skills, great grammar, quick turn around and pays attention to details. I would highly recommend him. Make a New LinkedIn Connection? Go Straight for the Juggler… NOT!